Our offer with the Shed Pack, a Green or living sedum roof on your shed, has gone down very well and the sales have been high. Interesting to see how many individuals are really catching onto this. 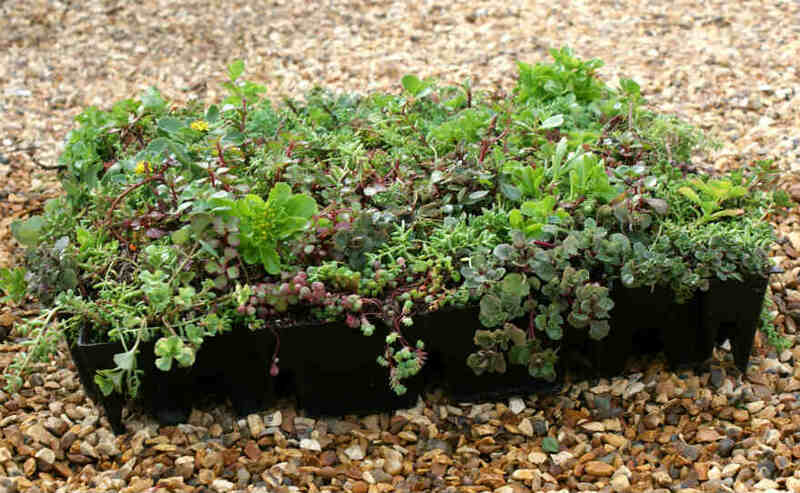 Would be so wonderful if everyone who owned a shed or a garage roof put Sedum onto it. Not only does it look so lovely but it encourages the wildlife and really helps the environment. Once our Green Roof Shed offer is over we were thinking of offering a similar offer for garages/stables etc. We have had a lot of enquiries and people like to buy the entire package. Roll on our new ideas for growing and selling Green Roofs!! Some friends of ours build timber garages and stables, we are going to work with them to offer a complete package of garage/stable block and Green Roof! Meanwhile I have been researching the effects of bees and Sedum. I shall write an article about it soon. Now that the weather is improving and we can at last get out and work on the fields the amount the Sedum has grown has been incredible. I love the winter purple colours which are now turning into shades of green which look so wonderful as I look out on this blanket of Sedum. I plan to put Sedum around my water garden area as it will save on the mowing! You really don’t have to do much to Sedum except just watch it grow. Time to put the chickens to bed.